In its present (and non-definitive) form, the F-TRACT atlas is provided as .tsv (tab-separated values) files that can be read in any table editor. 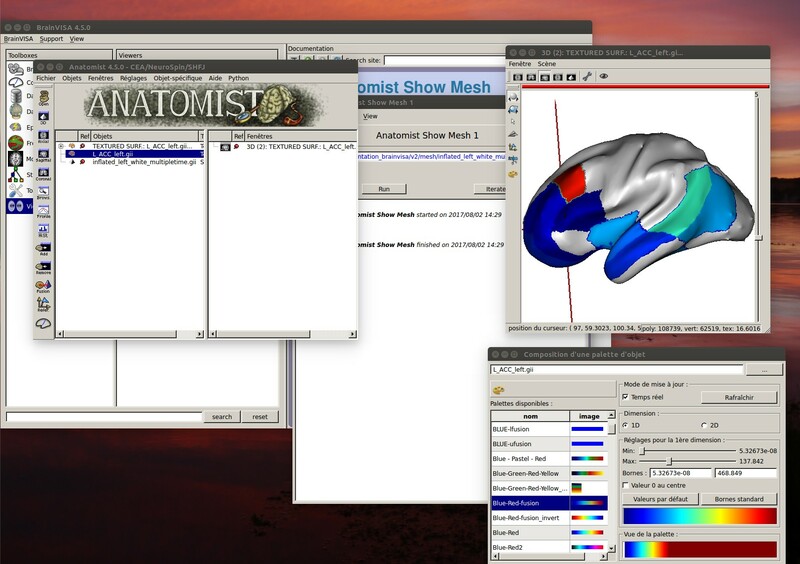 In addition, we provide a Matlab routine allowing to read the features of the atlas as Matlab variables. The atlas is provided for free use for research use only, with limited accuracy, which hopefully will improve with the different releases. Please cite David et al. (2013) Probabilistic functional tractography of the human cortex, NeuroImage, and Trebaul et al. (submitted) Probabilistic functional tractography of the human cortex revisited, when using the F-TRACT atlas. f-tract_v1706_marsatlas: Connectivity probablility and peak latency estimated from CCEP data recorded in 174 patients, only in the MarsAtlas parcellation scheme. f-tract_v1708_marsatlas: Connectivity probability with associated p-values as well as features describing fibers biophysical properties, estimated from CCEP data recorded in 174 patients, in the MarsAtlas parcellation scheme. The CCEP features are: peak and onset latency (LatStart), amplitude, integral, duration and the velocity estimated from the onset latency and the Euclidean distance between the parcels. Probability and latency maps: Images representing the connectivity probablility and peak latency for all the regions in the MarsAtlas parcellation. f-tract_v1712_marsatlas: Connectivity probability with associated p-values as well as features describing fibers biophysical properties, estimated from CCEP data recorded in 213 patients, in the MarsAtlas, Brodmann, AAL and MaxProbMap parcellation schemes. The CCEP features are: peak and onset latency (LatStart), amplitude, integral, duration and the velocity estimated from the onset latency and the fibers distance between the parcels. Features maps: Images representing the connectivity probablility and response features for all the regions in the MarsAtlas parcellation. f-tract_v1903_marsatlas: Connectivity probability as well as features describing fibers biophysical properties, estimated from CCEP data recorded in 315 patients, in the MarsAtlas, HCP-MMP1 and Lausanne2008 (resolutions 60, 125, 250) parcellation schemes. The CCEP features are: peak and onset latency (LatStart), amplitude, integral, duration and the velocity estimated from the onset latency and the fibers distance between the parcels. Download the last version of the atlas (see above). Once the archive has been extracted, you should see the .tsv files corresponding to different parcellations (aal, brodmann, marsatlas and maxprobmap). When _symmetrical suffix is present, it means that stimulations from the left and the right hemispheres have been gathered and that recordings parcels are therefore either in the ipsi- or contra-lateral hemisphere. In the tsv files, stimulation parcels are listed vertically (rows) while recording parcels are listed horizontally (columns). Use the read_atlas function with the path to the tsv file you want to read, and specify if it corresponds to the symmetrical (merged = true) or lateralised (merged = false) matrices. In the first release, you have access to the latency of the first response peak, the connection probability and the corresponding pvalue matrices as well as the list of the parcels of the atlas used. In the second release, you also have the CCEP features: the amplitude, the duration, the integral, the onset latency and the velocity. Use the plot_matrix function to plot the matrix in the same way as in Trebaul et al. (submitted). 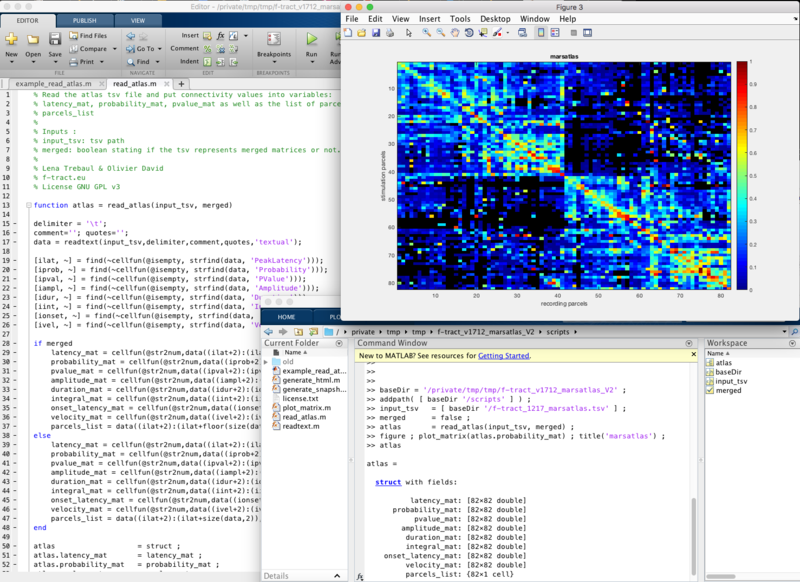 Try the example_read_atlas.m script (after having updated the Matlab path) to see the basic use of these functions. Download the maps for the a chosen parcellation. You will have the meshes, for each hemisphere of the inflated and non-inflated brain, and the textures corresponding to the stimulation of each parcel. 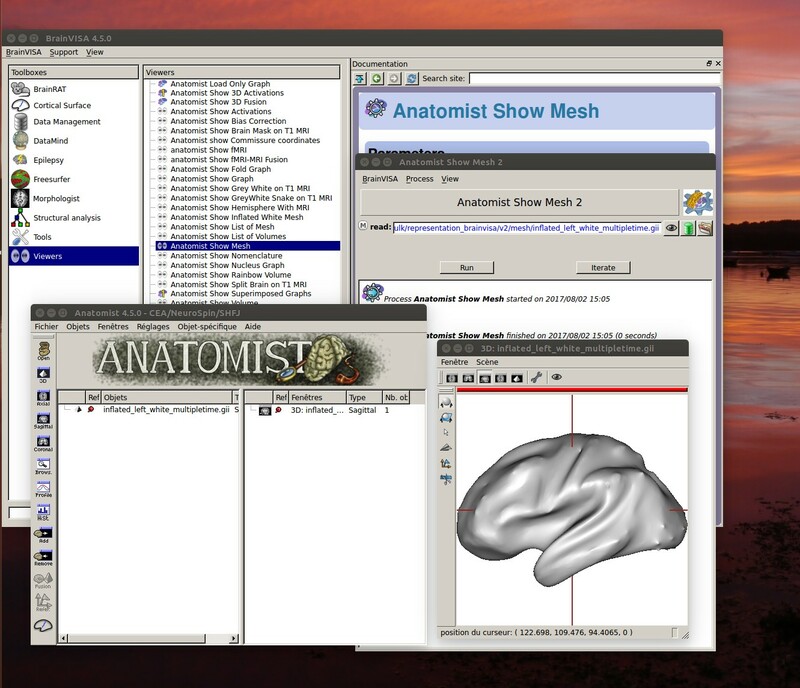 Go to Viewers > Anatomist Show Mesh and run the mesh of the hemisphere you want to look at. Here, to visualize L_ACC_left.gii, we choose inflated_left_white_ftract.gii. The Anatomist window will open up. Click on File > Open and choose the texture of the stimulated parcel you want. We choose L_ACC_left.gii. Select both the mesh and the texture and click on Fusion. Open the textured surface by moving it to '3D' and explore the map. For the first release, the first image represents the latency and the second one the probability. For the second release, the features appear in the following order: 1) amplitude, 2) duration, 3) integral, 4) onset latency, 5) peak latency, 6) probability, 7) p-value, 8) velocity. You can adjust the colorbar with a right click on the texture > Color > Pallet. Choose a fusion pallet in order not to display the parcels for which we haven't got enough data to represent it.